Cost of subscription – includes amortization of content/programming licensing cost, amortization of DVD libraries, postage costs to mail DVDs and CDN costs to stream content. Fulfillment expenses – includes cost such as content processing facility such as shipping and receiving center for DVDs, encoding of streaming content, etc. I just want to quickly understand the cost structure of their streaming business which includes mainly CDN and content licensing cost. Netflix recently announced that their subscribers watched an aggregate of 2 Billion hours of content in Q4 2011. Here is my estimate for their CDN cost based on this data. 2 Billion x 60 minutes x 60 seconds = 7,200,000,000 seconds. Assuming an average Netflix stream of 2 Mbps, the number of bits streamed = 2 Mbps * 7.2 Trillion seconds = 1,800,000,000 GBytes (1 byte = 8 bits). Based on data from Dan Rayburn’s streaming media blog, Netflix pays CDN providers 2 cents per GBytes of video steamed to their customers. So their CDN cost per quarter = 1,800,000,000 GBytes * $0.02 = $36m/quarter or $144m/year. This is only 4.5% of their 2011 revenue. Netflix has a funny way to account for streaming contents in the financial statement. It claimed that it needs to follow some ASC rule, who knows. Please check for yourself on Netflix’s IR website. This is how I interpret the streaming content cost. For contents that are considered Asset and has balance sheet components (based on slide #10 of the content accounting guide from their IR website), I used the “Amortization of streaming content library” line item from the cash flow statement as the amount charged for content cost in 2011 ($700m). Some content licenses are not capitalized and are not considered in the balance sheet. I suspect that this is some kind of revenue sharing plan with the movie studios where there is a minimum amount Netflix has to pay to make the content available for streaming plus Netflix may have to pay additional fee based on the number of times the movie is streamed. There is no easy way to get a breakdown of this since they are all included in the Cost of subscription line. Based on slide #11 of their content accounting guide, I had to go back to Netflix’s previous year (2010) 10-K and check the contractual obligation that is due in 2011. I took the Content obligations line that is due “Less than 1 year” as the amount that will be included in the 2011 cost of subscription ($530m). This does not include new contracts signed in 2011 that were amortized in the immediate quarters. It also does not include provisions for additional fee from the increasing frequency of movie streams as subscribers grow. So this estimate is on the low side because Netflix grew their subscribers 30% in 2011 and signed a bunch of new content deals in 2011. I am going to add 10-15% to this estimate and just round it up to $600m. To summarize, my estimate of their streaming content cost for 2011 is $1.3B. I did not have to work so hard to get the programming/content cost for Direct TV or Comcast because they just make it obvious in the line item. 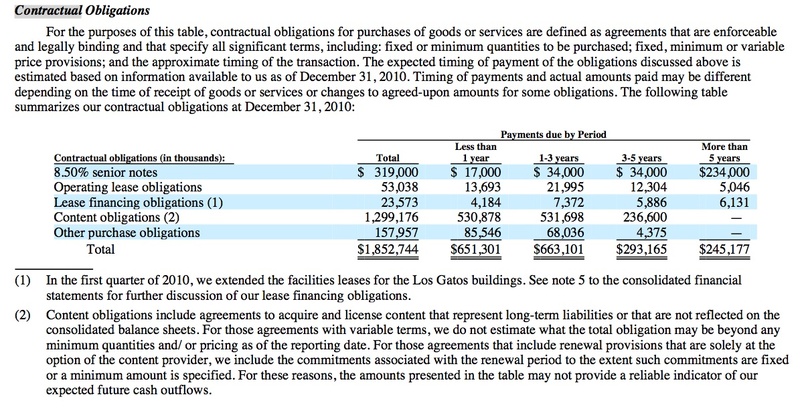 Here is a more detailed estimate of their cost breakdown in 2011.